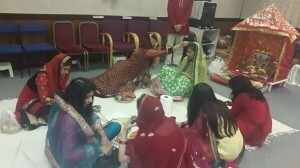 Inspired by their mother Gulabben Gangji Maicha in 1970 celebrating, Navaratri with Garba and Dandiya Raas at the residence in Southhall. The event was so popular that within a couple of days the back garden wasd too small. 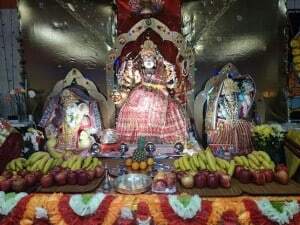 A suitable hall , the new hall located on the high street ,South hall was found and thus the beginning of “Navaratri Garba”. Everyone irrelevent of cast< Creed and background was welcome. 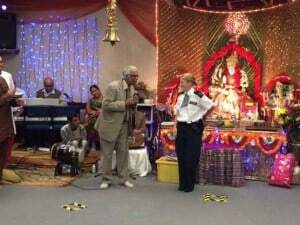 The Navratri celebrations took place in various locations including South Hall, Hayes and Perivale until finally moving to the Arya Samaj, Argyle Road in 1993. 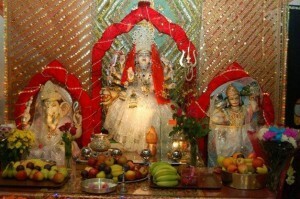 The Arya Samaj became a place for Navaratri Celebrations for years. They are delighted to let you know that the Hillingdon Council has now approved our plans for a substantial extension at the rear and side of the temple to build a new kitchen, toilets, store room will figure in the first phase of development. The second stage will involve construction of the Shrine in front of the temple and it will be on the lines of the image presented. This development will give storage facility, prepare Maha Prasad for Mataji, for priests and devotees. It goes without saying that future generations stand to benefit from the presence of an improvised sacred building. Of course, good work of this magnitude can be done only with substantial investment.